A data model gets more readable by using colors. 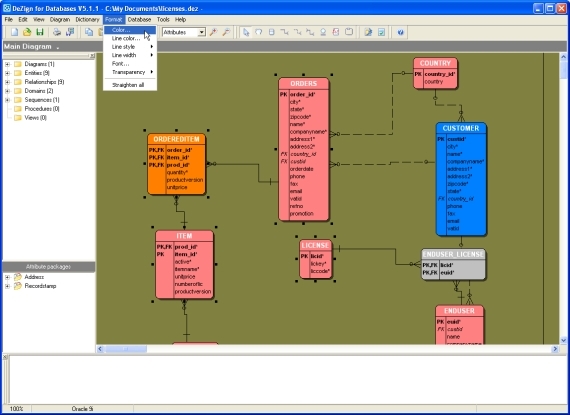 DeZign for Databases has several features to give color to your entity relationship diagrams (ERD's). Start by setting the background color of your diagram. 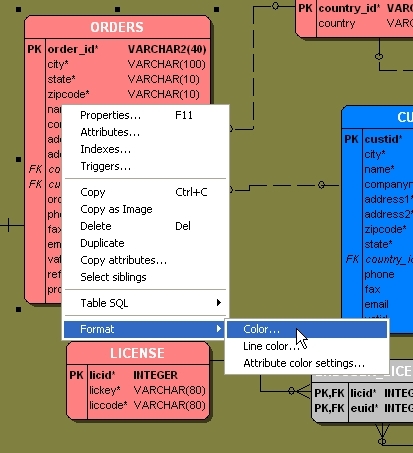 Every sub diagram can get its own background color. 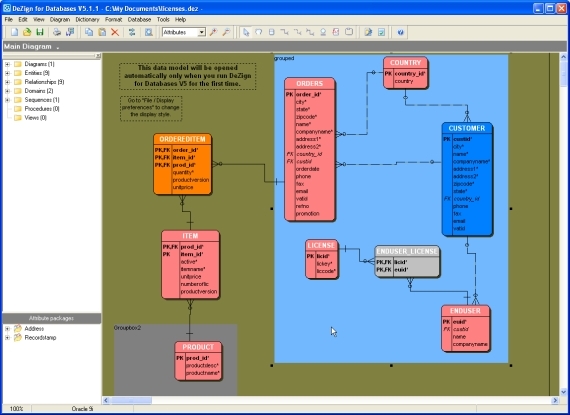 Change the background color of a diagram by selecting in the menu Diagram | Background color. A standard windows color dialog will now be visible. After assigning a background color to your data model diagrams, you can color the entities. In DeZign for Databases you can set a standard color for your entities. This can be done in the Display preferences dialog. This dialog can be found through the menu: File | Display preferences. The color for entities that are set in this dialog will be applied to all entities that had the "old" standard color and to all entities that are added to the project after setting this default color. Colors that were assigned to entities manually will not change if you change the standard entity color. When assigning color to an entity, make sure to choose a color that contrasts enough with the font color within an entity. The color of the text and the font can also be changed in the Display preferences dialog. Fonts and font color will be applied to the entire model. 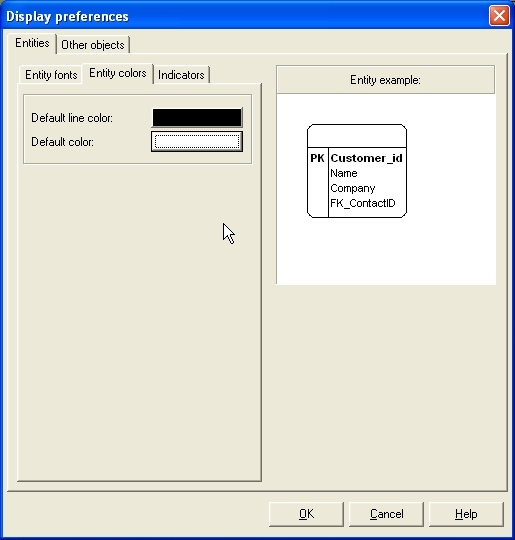 Figure 1: Display preferences dialog. It is also possible to assign individual entities with a different color. To assign single entities with a color, you need to select the entity in your diagram and right click to reveal the pop-up menu. In this menu choose Format | Color. Now choose the preferred color for the entity in the standard windows color dialog. Figure 2: Change the color of an individual entity. To assign multiple entities with a new color, select the entities you want to give a new color in the diagram window and select the Format | Color menu from the application menu (not the pop-up menu). Now choose the preferred color for the entity in the standard windows color dialog. Figure 3: Change the color of the selected entities. Next to assigning colors to the background, entities and text (fonts) in your data model, DeZign for Databases has the option to give individual attributes within an entity a different color. This is useful, for example, if you want to highlight a specific attribute. To change the color of an individual attribute, select the entity in your diagram and right click to reveal the popup menu. From this menu choose Format | Attribute color settings. A dialog will appear with a list of all attributes and their color. You can now change the color of the selected attribute by clicking on the preferred color on the right. Figure 4: Attribute color settings dialog. 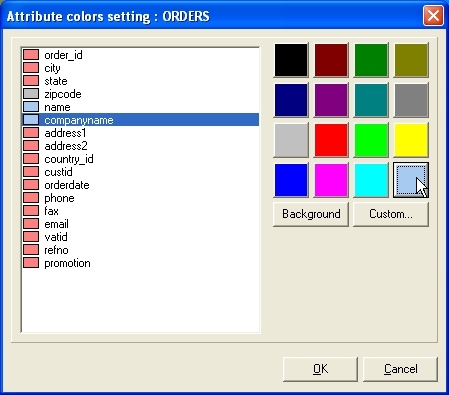 When choosing colors, DeZign for Databases uses the standard Windows color dialog. In this dialog is also room for custom colors. DeZign for Databases stores these custom colors. So when you start the program later these colors will still be there. Another color feature in DeZign for Databases allows you to add color to a groupbox (see Figure 5), so you can instantly see which entities are grouped together.